Επικοινωνιακή καμπάνια, με την οποία προτρέπει τους τουρίστες να ζητάνε απόδειξη με κάθε συναλλαγή, ξεκίνησε η Ανεξάρτητη Αρχή Δημοσίων Εσόδων (ΑΑΔΕ). Η ενημέρωση, η οποία βρίσκεται αναρτημένη και στον ιστότοπο της ΑΑΔΕ, περιλαμβάνει επίσης και αναφορά για τη δυνατότητα χρήσης από τους τουρίστες πιστωτικής χρεωστικής ή προπληρωμένης κάρτας. This message aims to inform you about your consumer rights in our country. Under Greek law, all hotels, restaurants, bars, cafés, car rentals and, in general, almost all suppliers of goods and services (with a few exceptions, such as taxi drivers and kiosks) are obliged to accept debit, credit or prepaid cards. Therefore, you do not need to pay in cash. You can ask to pay by card. Furthermore, all suppliers of goods and services are obliged to issue receipts to their customers. Consumer is not obliged to pay, in cash or by card, if he/she is not provided with a valid payment receipt (“apódixi”). Restaurants, bars, cafés, stores, mini markets and in general, almost all suppliers of goods are obliged to have electronic cash registers and are not allowed to issue receipts that are handwritten or printed in regular paper. 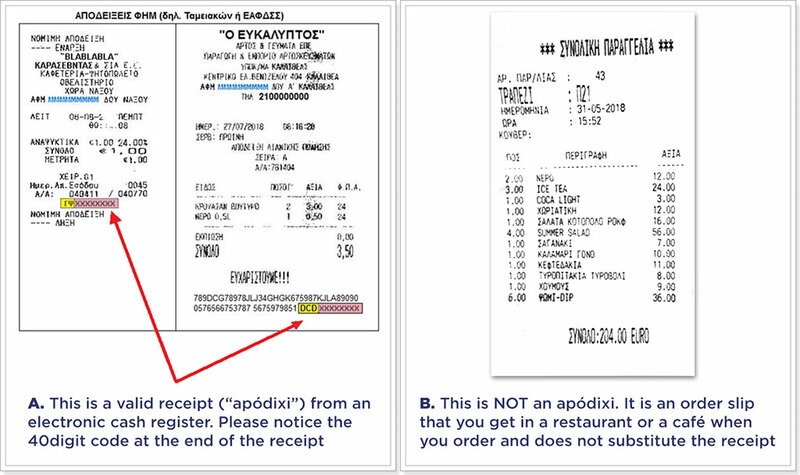 For those exempt from the obligation to have an electronic cash register (namely certain suppliers of services, such as hotels, clinics, doctors, lawyers etc), receipts, which in most cases are printed, must contain the name, address and the 9digit tax identification number (ΑΦΜ) of the supplier. So in all cases, before you pay you have the right to ask for a receipt and you are not obliged to pay if you don’t get one. It’s so simple to say in Greek: “Apódixi please”! One more thing. By using your card for your payments and asking for a receipt, you help the Greek Tax Administration collect taxes that are already included in the price you pay. Practically, you contribute to Greece’s financial recovery and offer us the opportunity to provide you with even better services next time you come to our country.